Hawaiian Airlines celebrated its fourth anniversary of Auckland service with a press conference on April 3 at the Hotel Sofitel Auckland Viaduct Harbour. 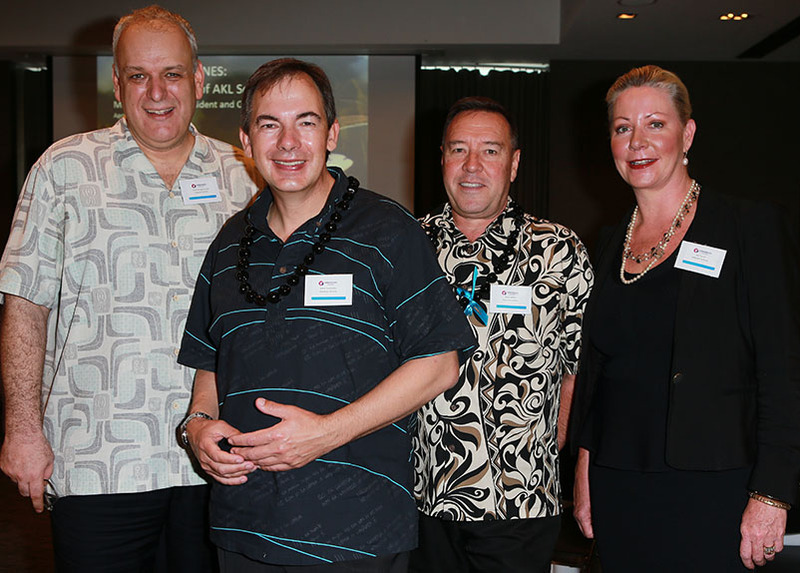 Pictured L-R: Theo Panagiotoulias, senior vice president of global sales & alliances, Hawaiian Airlines; Mark Dunkerley, president & CEO, Hawaiian Airlines; Russell Williss, New Zealand country director, Hawaiian Airlines; and Gai Tyrrell, Australia and New Zealand regional director, Hawaiian Airlines. AUCKLAND, New Zealand – Hawaiian Airlines, the only U.S. carrier to serve New Zealand with nonstop flights to Hawai‘i, is celebrating its fourth anniversary in the market. Since 2013, Hawaiian has shared its award-winning island hospitality with more than 120,000 guests aboard over 500 flights from Auckland to Honolulu. Mark Dunkerley, president and CEO of Hawaii’s largest and longest-serving carrier, highlighted the company’s successes, market investments and plans for growth at a news conference held on April 3 in Auckland. Prior to Hawaiian’s launch of three-times weekly service, fewer than 26,000 New Zealand travelers visited Hawai‘i in 2012, according to Hawai‘i Tourism Authority figures. Following Hawaiian’s entry, visitor arrivals from Auckland nearly doubled to more than 50,000 in 2013 and topped 60,000 for the third straight year in 2016. Four years ago, Aotearoa, with its shared heritage and deep cultural connections to the Hawaiian Islands, emerged as a natural and important part of Hawaiian’s international expansion. Hawaiian became the only U.S. carrier to fly into Auckland at the time it inaugurated service on March 13, 2013. Hawaiian’s exclusive central Pacific hub on O‘ahu, along with its broad network of transpacific and neighbor island flights, offers New Zealanders convenient connections to the U.S. mainland and unmatched access to the Hawaiian Islands. The airline also provides travelers the option of taking a dual-destination vacation with a free stopover in Hawai‘i before connecting to North America or on the return to New Zealand. Last year alone, more than 18,000 of Hawaiian Airlines’ guests arriving in Honolulu from Auckland headed to one of the carrier’s 11 gateway U.S. cities or to an island other than O‘ahu. Visits to Kauai, Maui and the Island of Hawai‘i all more than doubled between 2012 and 2013 and have held steady in recent years as New Zealanders discover the ease of neighbor island travel and the unique experiences found on each Hawaiian island. Hawaiian’s flights between Auckland and Honolulu have spurred $247.6 million in total visitor expenditures and generated $27.6 million in tax revenues, according to the Hawai‘i Tourism Authority. In December, Hawaiian introduced to its Auckland route a Premium Cabin featuring 18 lie-flat seats in its A330 aircraft. Guests enjoy luxury amenities, world-class island cuisine prepared by Hawai‘i’s top chefs and access to 100 hours of movies and TV on a 13-inch widescreen tablet. The airline also increased Extra Comfort seats to 68 from 40 to meet growing demand for its premium economy product that offers five more inches of legroom, priority boarding at the gate, complimentary on-demand in-seat entertainment, and a personal power outlet. Main Cabin seats, the roomiest in the Auckland-Honolulu market at 18 inches, are equipped with high-resolution LCD touch-screen monitors and a personal USB port. For more information, please visit www.hawaiianairlines.com. Now in its 88th year of continuous service, Hawaiian is Hawai‘i’s biggest and longest-serving airline, as well as the largest provider of passenger air service from its primary visitor markets on the U.S. Mainland.